A pesticide in Brazil's drinking water is not behind microcephaly. 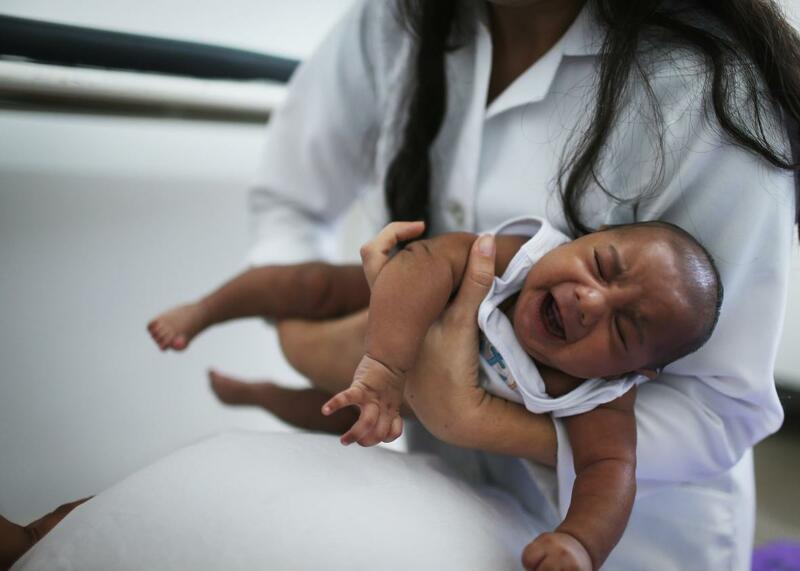 A 6-week old baby with microcephaly is treated at a clinic in Recife, Pernambuco state, Brazil, in January 2016. People, calm down. That’s the tone the media has adopted as of late on Zika, the mosquito-transmitted virus that has inspired fear worldwide. That assurance is badly needed: In January, the World Health Organization declared an international public health emergency after raising alarms that the once-unknown virus was “spreading explosively” in the Americas. Since October, Brazil has seen more than 4,000 reports of microcephaly—a condition in which babies are born with unusually small heads and incomplete brain development—thought to be caused by the Zika virus. Now, a group of Argentinian doctors is saying that the rise in microcephaly cases in Brazil has been caused not by the new-to-the-scene Zika but by a more familiar boogeyman. A report released last week by the group Physicians in Crop-Sprayed Towns claims that the real culprit is, in fact, a pesticide called pyriproxyfen—a larvicide that has been used to keep mosquitoes from breeding in the tanks that hold Brazil’s drinking water since 2014. The report alleges that it is “not a coincidence” that many of the areas where the pesticide is widely used are also the ones seeing a surge in microcephaly. And here’s the kicker: The Argentinian group says that the company that manufactures the pesticide, Sumitomo Chemical Co, is a “subsidiary” of Monsanto. Neither Monsanto nor our products have any connection to the Zika virus or microcephaly. Monsanto does not manufacture or sell Pyriproxyfen. And, Monsanto does not own Sumitomo Chemical Company. It is, however, a business partner like others in the area of crop protection. To be clear: There has been no scientific evidence connecting microcephaly to the use of pyriproxyfen. But just the word Monsanto has many scared. The local government in Rio Grande do Sul, a state in the south of Brazil, announced Saturday that it would cease the use of the chemical in drinking water after claims that it might be behind the surge in birth defects. “We decided to suspend the use of the product in drinking water until we have a position from the Ministry of Health, and so, we reinforce further still the appeal to the population to eliminate any possible mosquito breeding site,” Joao Gabbardo dos Reis, state health secretary in Rio Grande do Sul, told the Telegraph. Brazil, meanwhile, denies that the pesticide is to blame. The country’s government points out that the chemical has been deemed safe by the WHO at the recommended levels in drinking water—it’s also approved for use in Europe and the United States, though not in drinking water—and that there have also been outbreaks of microcephaly in regions where the pesticide is not used. Others, including environmental expert Mark Lynas, are calling the pesticide connection scientifically implausible and a “conspiracy theory.” Lynas, who was until three years ago famously anti-GMO, says anti-GMO factions are using the sketchy pesticide connection as new way to push their agenda. “In order to achieve threshold toxicity levels that have been seen in animal studies, a person would have to drink 1,000 liters of water every day,” Lynas write on his website. Nevertheless, evidence for a causal relationship between Zika and microcephaly is mounting. Doctors have already established that the Zika virus has been present in blood, tissue, and amniotic fluid samples of early-pregnancy miscarriages and the brains of newborns with microcephaly, and new evidence is being reported weekly. Disease specialists suspect that a microcephaly outbreak in French Polynesia two years may be linked to Zika. And the WHO says we will likely have that definitive link within a matter of weeks. In this kind of international crisis, people want answers. They want information, certainty, a place to pin the blame—anything to help them feel more in control of a scary situation that’s been framed as apocalyptically out of control. Unfortunately, that isn’t how science works. Before we can establish 100 percent causal proof that Zika causes microcephaly, thorough tests must be run—and that takes time. Until then, we have to be patient and not give in to rumors. “Until we have causal evidence for a link between the disease and a certain type of pesticide, it’s unscientific to jump to conclusions based on inconsistent circumstantial evidence,” as the science news site Science Alert puts it. In other words: People, stay calm.